This year I completed my written and clinical examination as part of my basic physician training, and as most people who have gone down this path will tell you, it’s a fairly tough year. Medicine is a tough profession in and of itself, with long ward rounds, learning curves of various gradients on different terms, large amounts of unpaid overtime and the constant pressure to perform. Always thinking about getting that reference for that next job. Add a written exam held once a year and then a clinical exam held once a year… it is a year filled with learning and growth. But also with anxiety, stress and fear. In June this year, I was coming back from hospital about 9pm after yet another desperate after hours chase for diastolic murmurs, rare neurological disorders and palpable kidneys. I had come in early that morning to do a long case at 7am with my mentor. I had been doing this for much of the previous three months… I was getting tired. My Saturday mornings had all been taken up with the dreaded but useful “Saturday cases”, a daunting process of performing a clinical exam in front of three to four of your colleagues and usually examined by that consultant who always thought you were an excellent registrar. During this thrilling period in my life, I had recently become aware of Paul Kalanithi’s “When Breath Becomes Air”. My brother, who works in a different industry, had been going on about this book for quite a while. Usually I ignore any book referrals from him for several weeks until he stops talking about it, but this time he was unusually persistent and forcibly put the e-book on to my phone. I reluctantly started reading it after this long day and I was immediately taken by both the story and the writing – the Chief Resident in Neurosurgery at Stanford University diagnosed with metastatic lung cancer, who had written a book in his last few years. The book is an extraordinary experience and I have now spoken to many people who have read the book and pleaded with other people to read the book – everyone I have spoken with has come away changed from the experience of reading this book. 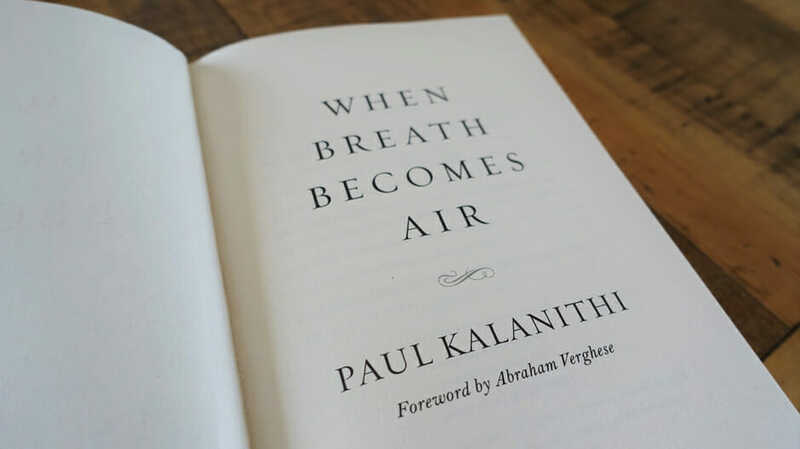 Paul Kalanithi was well placed to write this memoir as he had a Master of Arts in English literature from Stanford University and a Master of Arts in the History and Philosophy of Science and Medicine from Cambridge University – reading his writing is effortless. He is able to capture his experiences eloquently and succinctly and is rich with cultural and literary references (which you will get!). I came away with many thoughts from the book, but a few that came through clearly were the following. This was one of the key messages of the book, and it especially resonated with me during my 18 months of basic physician training where I watched myself and colleagues sacrifice (relationships, hobbies, physical health and mental health) so much for the sake of passing an exam and attaining future employment. When you spend more time in a hospital than outside, it is easy to become institutionalised and believe that there is nothing more to life than the hospital and progressing in your training. Interestingly, Kalanithi continues to work while he has metastatic lung cancer and he continues to pursue completing his qualification, and continues to wonder whether he should pursue academic papers, conference presentations, and prestigious positions. How would a life limiting diagnosis alter your approach to the projects you invest yourself in? These are really tough questions to answer because so many of us put so much of ourselves into pursuing these very worthwhile projects that have benefits for ourselves, but also benefits for so many other people. Under the harsh light of mortality, Kalanithi struggles with these questions throughout the book and his views evolve gradually as his illness progresses. In another location, Kalanithi further reflects on the inevitability of failure in medicine. For the reader, it becomes immediately clear that neurosurgery is vital to Kalanithi, and practicing it has given him a lot of satisfaction and joy. It is also clear that he has devoted much of himself to it, perhaps too much as he himself so clearly put it. I think while we are quick to tell our colleagues in other industries that medicine is more meaningful or more satisfying, we should remember that it places large and costly burdens on us, especially in more taxing specialties such as neurosurgery. In the second quote, Kalanithi reminds us that we will slip and not to be too hard on ourselves when that happens, and also the important principle that the disease is not our responsibility but responding to it is. The fact that the lungs are getting progressively worse, the heart failure is limiting them even more, or that the cancer has returned is not a fault of the treating doctor. These are the realities of disease combined with the limitations of medicine. The deck is stacked. There are no pat answers in this book and the universal issues of how best to live and how to die well are left to be as complex as they have been and will hopefully always will be. Dying is messy, difficult, challenging, horrid – but also, apparently, a marvellous opportunity for reflection and perhaps moments of profound peace and enlightenment. In the busy humdrum of middle age, of raising children and slowly scrambling up the career ladder, Kalanithi was cut short but he has produced a book that will linger for many years to come and will influence future practitioners as they reflect on the role of medicine in their lives and will hopefully guide us towards more rounded and gentler lives. I was trying really hard to think of an amusing Read More..